Hello lovelies-here's another currently post to let you all in on a sneak peak into our lives and what we are up to now!! NAIL COLOR : still have my Shellacs on from my brothers wedding-white and gold that I got done in Bellissimo, Galway-love them!! EATING : I am working my way thru a rather large box of jelly belly jelly beans my sister bought me home from America!! LISTENING TO : Bang Bang-Jessie J, Iggy Azalea & Nicki Minaj..... Quite the catchy song. WATCHING : the X factor.... Every year I get hooked without fail!! CREATING : working on all kinds of projects this week Halloween goodies, thanksgiving.... It's all go go go! 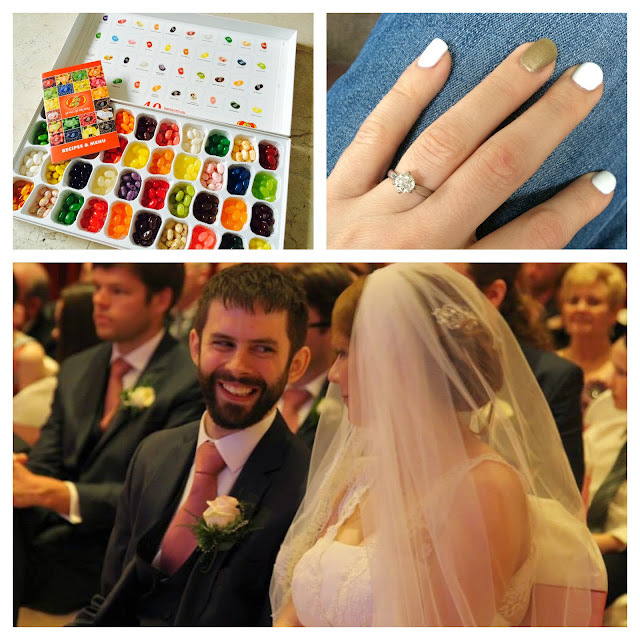 THOSE jelly beans, my Shellacs and the happy couple! NAIL COLOR: Nothing at the moment… need to paint them badly! EATING: Thinking of doing hot and sour soup for lunch today from one of my favorite sushi places near my work. I have a bit of a sore throat from allergies, so soup is sounding pretty yummy. LOOKING FORWARD TO: Some time in my sewing room! I have a stack literally about a mile high of fabric and patterns that I am dying to start working my way through. PLANNING : Trying to get myself organized. I can’t even believe it, but I am already starting to think about planning for the Holidays. How is it September already?! CREATING: Just whipped up some pillows last night using some of the brand new Gorjuss fabric from Santoro! Thinking of doing a little upcoming post on what I have made, so keep an eye out!